The village of 2,354 inhabitants is situated on the edge of the Small Plain. It was first mentioned in records under the name Macha in 1237-1240 by Albeus, the dean from Nyitra. The name either originates from a Slav personal name or refers to the surrounding wetland ('mocsár') according to the local traditions. In the age of the Árpáds it was a royal property. From 1291 it belonged to the archbishopric. After the Turkish devastation the village was quickly resettled. The Benedictine monastery was built around 1760 in baroque style. The bitter water, which comes from the springs in this territory, was sold under the name Pannónia. 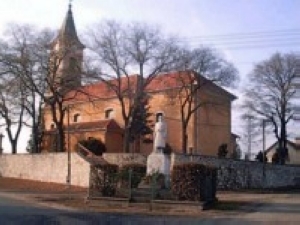 The monument Roman Catholic church dedicated to the Queen of Rosary was built in 1758. It has baroque furnishings from the 18th century. It was extended in 1851. In 1903 it was destroyed in a fire with the other buildings of the village, but the next year it was rebuilt with the support of the archbishop and the congregation. Another important monument is the statue of the Holy Trinity with folk elements, which was erected in 1824 to commemorate the victims of the plague. The Calvinist church built in 1780 was burnt down in 1945, in its place a memorial plaque can be found. The new church was built in 1952-54 based on the donations of the congregation, the tower was added in 1968. The most frequently visited part of the village is the resort park established in the territory of the former mining lakes. In the Oázis Leisure Centre run by Herczeg és Társa Ltd. the crystal clear water is ideal for bathing, camping and fishing. Those who are interested in the past of the village can visit the Memorial House opened in Hősök square in 2000 to commemorate the Millenium. The exhibition gives an overview of the history of the village. In 2001 a headboard was erected to commemorate the fact that poet Mihály Csokonai Vitéz was having a rest under the wild pear tree on the stations of the cross in 1798. 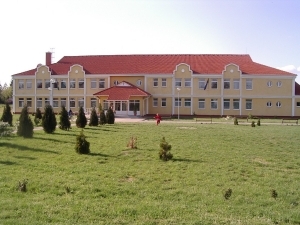 In 2002 a new primary school with 8 classrooms was opened.